I have delusions of grandeur when it comes to breakfast. In a similar vain, I have ambitious plans of questionable achievement when it comes to cooking/baking Nordic foods. Either I’m subconsciously addicted to Ikea (which probably would be true if I lived closer to one) or I’ve watched too many videos featuring Magnus Nilsson and Rene Redzepi (this is definitely true). The reality is that I meal prep my breakfasts most of the time, and I want something quick to put together. Lately, I’ve been making the same baked oatmeal recipe for a few months now. But that doesn’t mean that I’m not on the lookout for new ideas. Let’s be honest – it’s only a matter of time before I hit baked oatmeal fatigue. When I saw the cover of “Breakfast with Beatrice” by Beatrice Ojakangas, I was intrigued. The cover has minimalist but colorful Scandinavian inspired kitchen illustrations. The tag line under the title says “250 recipes from sweet cream waffles to Swedish farmer’s omelets.” It sounded like it had variety. It had the word Swedish in it. It was 250 recipes. What’s not to like? Normally, this is the part of the post where I like to list the recipes that I’m particularly interested in making. However, I’m not going to, because I’m not sure that there’s a recipe in the book that I don’t want to make. In general, these recipes aren’t trendy. They aren’t ingredient crazy or meant for a large weekend project. Instead, they sound like the kind of recipes you inherit from a beloved family member or recipes you have fond memories of. I had trouble picking out a recipe test out… too many sounded delicious. I originally thought about making the wild rice and blueberry muffin recipe, but I didn’t have any wild rice in my pantry and was unwilling to buy some. (Note to self, clean out your pantry so that you can do things like buy wild rice without feeling bad about it.) I eventually settled on the yogurt nut brown bread recipe, which only has 8 ingredients: rye flour, whole wheat flour, all purpose flour, baking soda, salt, plain yogurt, light molasses, and chopped nuts. I don’t keep whole wheat flour in my kitchen because I’m convinced that most commercially available whole wheat flour doesn’t taste very good, so I subbed with spelt flour. I also didn’t have light molasses but that was easy to substitute with a blend of regular molasses and maple syrup. Other than that, it was very easy to put together. I didn’t need to break out a mixer for this. Using a whisk and a spatula was good enough. Baking day! UPDATE – related blog post is up now! In the author’s own words, this bread is “compact, dark, grainy, and rich-tasting.” It is definitely dense and dark, but I wouldn’t say it’s grainy even though I know that it’s made with whole grain flours. I thought it was a bit chewy (in a good way) and moist. The molasses flavor hit my tongue first, but quickly gave way to an earthy flavor. The more bites I took, the less I noticed the molasses. I ate half a slice with some almond butter, and enjoyed that too. I think this recipe makes for a great everyday quick bread, perfect for those times I want bread but am too impatient to work with yeast. Later this week, I think I’ll see how it pairs with other foods like eggs, ham, or cheese. Yogurt nut brown bread. UPDATE – related blog post is up now! Disclaimer – I received this book from University of Minnesota Press for this review. I’m not getting paid for this post. The views and opinions expressed are purely my own. Just in case anyone is curious, I only use SAF instant yeast when I make my doughs. And I’ve been making a lot of doughs lately. Sorry I couldn’t come up with a wittier title. So, challah #2 wasn’t all that special to me. Challah #1 was courtesy of Beth Hensperger’s book “Bread Made Easy” while challah #2 was from http://steamykitchen.com/blog/2008/01/13/challah/, and if you get the chance to look at the ingredients, they aren’t all that different. It was, if I recall, a difference in the amounts of fat being used. The No-Knead Challah was mild in comparison to Ms. Hensperger’s, and Asano-mama and I agreed that challah #1 was tastier. And honestly, I don’t mind a little kneading. 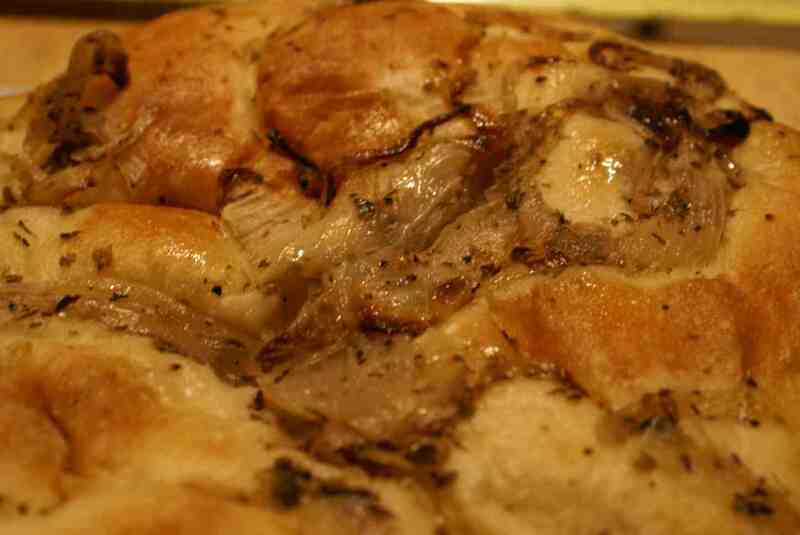 There’s only one photo of challah #2… mostly because it looked uglier than challah #1. Also, I realized after the fact that I think I braid my breads backwards from the traditional braid. haha! If you follow Chef John’s instructions, you end up with four individual pizza crust servings. He means thin crust. I prefer to think of it as two servings to make a thicker crust. At that point, I’m not sure if I could eat a whole pizza on my own (that’s a bit of dough! ), but your mileage may vary. As for toppings on the first pizza that I’ve ever made from scratch, I used tomato sauce, mozzarella cheese, jack cheese, and slices of red bell pepper. It was beautiful, it was perfect, and I devoured it all in twenty minutes. But that wasn’t the end to my madness. Baking means a warm kitchen during the winter, so I baked some more. 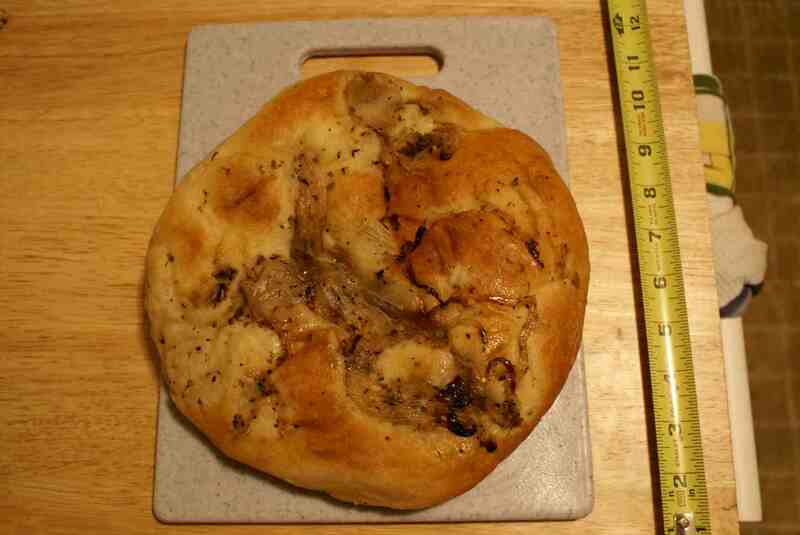 This time, I went back to my trusty “Bread Made Easy” book, and picked out a recipe for a holiday sweet bread. The recipe makes two loaves, one of which I left plain and the other I put in dried figs. I had also replaced the orange extract with almond extract, which I couldn’t tell in the end because it was too subtle compared to the flavor of butter. The plain loaf was a gift for a co-worker, so I only have pictures of the fig loaf sliced. Sel de la Terre has an amazing fig loaf, but it’s not so sweet and they use fresh figs. While my fig loaf was good, I really wanted the Sel de la Terre version. I guess it’s something I need to further work on. The last bread I made was an experimental red pepper hummus bread. Again, my recipe was courtesy of the Foodwishes video blog (http://foodwishes.blogspot.com/2008/11/holiday-pumpkin-bread-you-want-it-but.html). All I did was replace the amount of pumpkin with an equal amount of red pepper hummus. There was a little bit of kneading involved because I was having trouble getting the dough to come together with just a mixing spoon. I also doubled the yeast so that I could make it all in one day. Despite my red pepper hummus bread being ugly, it photographed rather well. So, that’s been the bread adventure so far. I think I am experimenting with mahleb in my bread tomorrow. Tonight, the plan is to make some roasted veggie soup. If anyone wants either the challah or the holiday bread recipe for Beth Hensperger, please comment. I’d post it now, but my book is on the other side of the room from me and I’m currently hiding in a sleeping bag for warmth. I’ve finally been visiting the farmer’s markets. Honestly though, I’ve just been there to pick up some handmade bread. I’ve been wanting to visit Clear Flour in Brookline for quite some time now. A couple of years ago I took a bread baking class at the Cambridge Center for Adult Education. The instructor was a petite woman with dark hair (vaguely reminding me of Amy Lee of Evanescence) who was a private caterer named Leslee. (I think that’s how she spelled her name… I just remembered that she spelled it differently from the usual “leslie”) Anyway, she explained her bread expertise background which was as a baker at Clear Flour. Listening to her talk about the bakery had me hooked. Unfortunately, the truth of the matter is that Brookline is not convenient for me at all. So, I’m very thankful that they decided to join a couple of farmers’ markets this year. The first time around, I purchased a half loaf of Pain De Mie ($3.55) and a loaf of Onion Focaccia ($3). The pain de mie was a HUGE loaf – a half loaf is probably the same size of a loaf of machine made bread at the market and about the same price. Why on earth wouldn’t I buy it? It’s a nice white bread and very soft with the kind of texture I wish I knew how to make at home. I was also very impressed that the breads were still warm when I bought them. 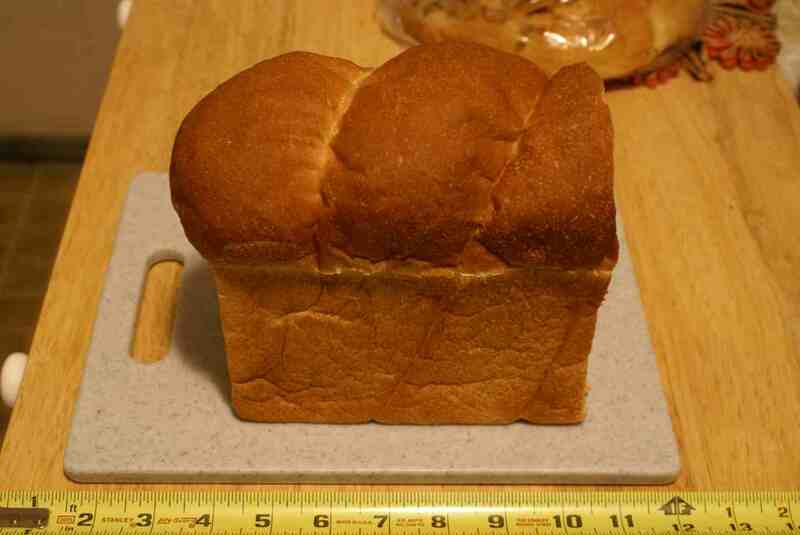 In some of the photos, I have a measuring tape just to give you and idea of the bread size. The second time I visited the farmers’ markets, I got half a loaf of buckwheat with walnuts ($2.15) and half a loaf of whole wheat ($2.25). The wheat loaves are no where near as giant as the pain de mie (btw, the half loaf of pain de mie lasted pretty much one week exactly before it was gone) but I didn’t want to just buy one whole loaf to try. I really wanted the buckwheat one but feared I wouldn’t like it. Plus, whole wheat is a good everyday bread. Well, I tried a slice of both when I got home and I was surprised. I really like the buckwheat and not the whole wheat at all. Both taste like they used sourdough starters. 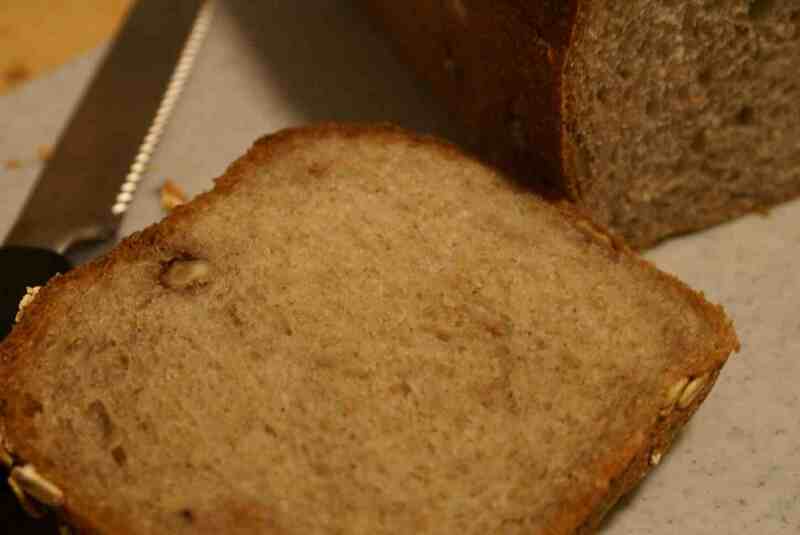 However, the buckwheat loaf was much milder in flavor. I didn’t even find the walnuts to be distracting (and there weren’t too many nuts). The whole wheat one was much too sour for my liking. Ick. I think I’m going to have to eat that one with jam or peanut butter. Today, I went for just a loaf of the buckwheat with walnuts ($3.85). I dug into it as soon as I got home. 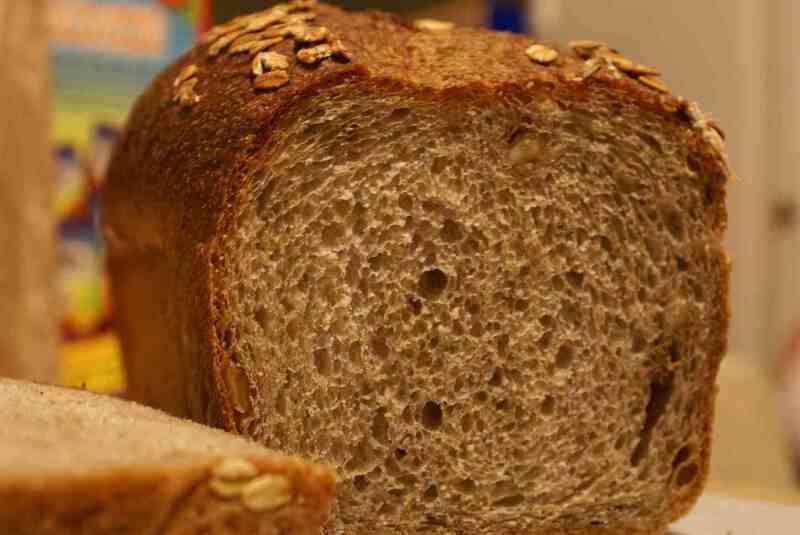 The buckwheat loaf is a standard size loaf – about 9×4 or there abouts. Anyway, I can safely say that so far I love Clear Flour. It’s affordable and perfect for those days when I’m too lazy to make my own bread (which is almost all of the time). Looking at their website, there are a lot of breads that are only made on some days of the week which I really would like to try. I’ll have to make a special effort to get over to Brookline.